We have some winners for the Ornament Giveaway! It was so fun to hear all of your book recommendations. There are several I need to hunt down at the library for sure. 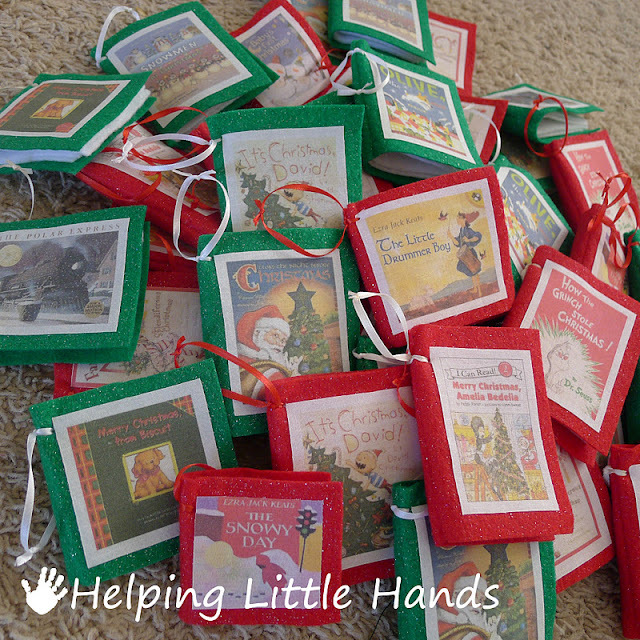 If you're not a giveaway winner and want to make your own book ornaments, click here for the tutorial. I also tried out a few variations when I made a few more. No-sew option...I tried using my glue gun down the spine of the book to hold the pages in and it works great! Muslin page option...I ran out of white felt, so I tried using some muslin. The muslin is easier to write personal messages on, which is nice. On the other hand, it also results in a much thinner book, so it all depends on the look you want which one you'd prefer. The following winners will get a set of two book ornaments. #8 Hip Hippo Designs said... I follow your blog! My favorite Christmas book is The Tiny Star! #31 Judy@cutest-little-things.blogspot.com said... I really wish I knew how to use a sewing machine!!! I love these! #34rainbowcreek said...Adorable, thanks for the tutorial and PDF. I just taught my granddaughter to use the sewing machine, she will be thrilled to have a project like this. The winners have been contacted by email, so PLEASE reply back to me in time for me to get these mailed out by Christmas!